When I’m not writing science fiction, sometimes I write about science — specifically about everyday things you can notice and experiment with. Like ketchup that won’t come out of the bottle, optical illusion that baffles you, the paper airplane that you fly across the classroom (or did once upon a time). I also write about writing — about why I write and how you can write, too. Sometimes I write about gender issues. And on a few rare occasions, overwhelmed by the connectedness of things, I write about science and gender and writing all at the same time. I recently wrote an essay about how Robert Heinlein and the Holy Roman Catholic Church made me the writer I am today. You can read it here. This essay, and a yet-to-be-written article, will be in a special issue of LIGHTSPEED magazine titled Women Destroy Science Fiction! 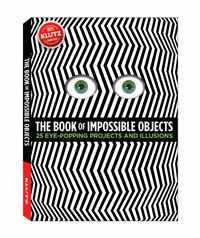 The Book of Impossible Objects, a compendium of the impossible, which comes with weird objects to make and experiment with. LEGO Chain Reactions, a book that shows you how to build Rube Goldberg machines with LEGO bricks. My friend Paul Doherty and I write a column about science for the Magazine of Fantasy and Science Fiction. You can find them online at the SFSite. For more than 20 years, I was a senior writer at the Exploratorium, San Francisco’s museum of science, art, and human perception. It’s a marvelous place and I still visit as often as I can. Working at the Exploratorium taught me how to explore, experiment, and ask questions — essential skills for any scientist or writer. The Exploratorium store carries some of the books that I wrote and copies of the magazine that I edited for the museum.